Every energy efficiency program in the nation, whether a full energy audit or Home Energy Score requires a 3rd party QA oversight process. When it comes to Real Estate this is even more important! The last thing a Real Estate Agent wants is another auditor re-doing what in their mind, was already done by a professional home inspector or a home owner complaining that the score is wrong. Moreover, a realtor will not allow their clients, the sellers, to absorb any more undue stress or physical inspections than need be. This is where I.D. energy’s Desktop Q.A. oversight comes in. It eliminates the burden of required physical field QA in the real estate market and ensures a higher quality Home Energy Score assessment. If completed professionally and correctly, this process will enhance Real Estate transactions for REALTORS and customers alike, and enhance the real estate experience such that listings will sell faster. Our hope is that we can publish these statistics in time to come. In April 2018 I.D. Energy was awarded the “Innovation Award” by the U.S. Department of Energy’s Home Energy Score for our approved remote quality assurance program. It’s called “Desktop QA” or DTQA. It is simple, easy and an efficient way to accomplish your QA requirements without interrupting the daily schedules of your real estate agent network. 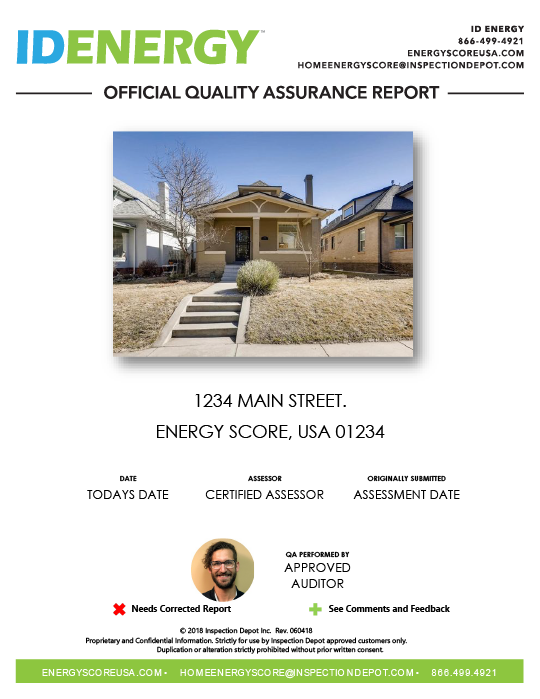 Rather than performing a second independent in-field assessment for Quality Assurance, the DTQA Auditor receives photos of the home’s key features. Using these photos and other supporting information readily available, the Auditor can enter a separate QA on the DOE scoring tool, and verify the data entered by the Assessor compared to the photo evidence, matches that of the inspector. Any points of contention can be discussed through automated notifications and emails between the Assessor and QA Auditor. At the end, this becomes an excellent learning experience for the inspector, and in all ways, helps to shape the inspector’s skills and technical expertise. See how our Desktop Q.A. Rates compare to the industry standard and other Home Energy Score Q.A. providers. Sign up now for the best rates and service available to Home Energy Score Certified Assessors.